I had my longest ever market this past weekend – 3 full days. Well, almost. Friday was only 3 pm – 8 pm, but 5 hours plus set up is still pretty close to a regular (11 – 5) craft show. Phew! That’s a lotta crafting! Though it was definitely a lot of work, I really like doing longer shows like this. If one day is slow, you still have time to make up for it the next day. And by Sunday, I was happily able to start my day knowing that I’d already covered my table fees for the show, so as long as I sold *something* that day, I was in the black. Great way to start the morning! Anyway, how freaking awesome are these??? 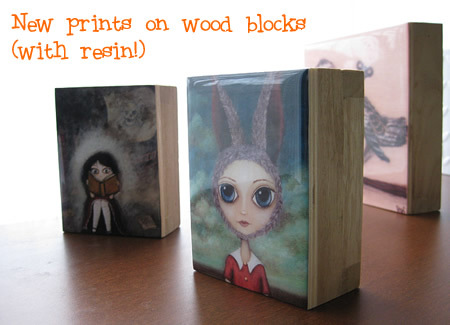 I was excited with the wood block prints when I just had them coated with varnish, but all shiny and glossy? The look like giant versions of my Scrabble tile pendants and make me oh so happy. The colors are rich and saturated and wet. Love! aside: Why yes, I *have* had a lot of coffee today. Why do you ask? I noticed something odd at this particular market compared to other ones I’ve had tables at. This past weekend was in a high school gym off the trendy Commercial Drive area, where my art tends to go over pretty well. The event itself wasn’t “craft as a movement” trendy, if that makes sense. There were no hipster mustaches or wrist cuffs made from old vinyl records. There were a few people I knew and a few young vendors, but the overall feel was more the type of craft show your grandma might attend. I should note here that I’m not knocking either type of show. Any type of handmade expression is great in my books, but they’re not all going to have the same customer base. That’s all. Don’t ride your fixie over here to poke me with your skull-cap knitting needles. Don’t gather the blue hairs to pelt me with crocheted pot holders either. We’re all good. I usually get questions like, “Are you the artist?” or even “Did you draw all these?”, but I’ve never seen people so confused as to what I was selling. So. Many. People seemed utterly confused that I was a painter and had painted my girls simply from my imagination. I even had a couple of original canvases out sitting on easels! And still, a good many folk could not seem to fathom that I was selling prints and magnets and postcards with characters that weren’t trademarked by Disney. It was very odd. I got lots of compliments and had a really good time, but still…very odd. glad it went well (and the questions were, er, stimulating. see you at Dunbar this weekend! I am a fan now. I saw your art at the art show yesterday on the drive.